Our goal is to help our members progress in whatever area you want to improve, such as squats, push ups, pull ups, or ________ (insert your goals). We've refined our current program and created a more predictable cycle for our programming for the practical progression of each of our individual goal(s). With our new 3-day split program’s unique structure, we have designed it so you can, and are encouraged, to come 5-6 days a week and you won't overtrain because of specifically how we will be balancing workouts each day. See a peek inside our exact training split. Every year we challenge our Synergy Kettlebell members to swing our "The Pumpkin Bell" (orange). Everyone can participate, even beginners, and ANYONE has the same chance to win the prizes. All you have to do is swing, swing, swing away the pumpkin Kettlebell (orange competition Kettlebell 28kg/ 62lbs), a minimum of 10 times for the ladies and 20 times for the guys, from October 1st through the 31st and you will be automatically entered into our raffle. The raffle will be held on Nov 1st. 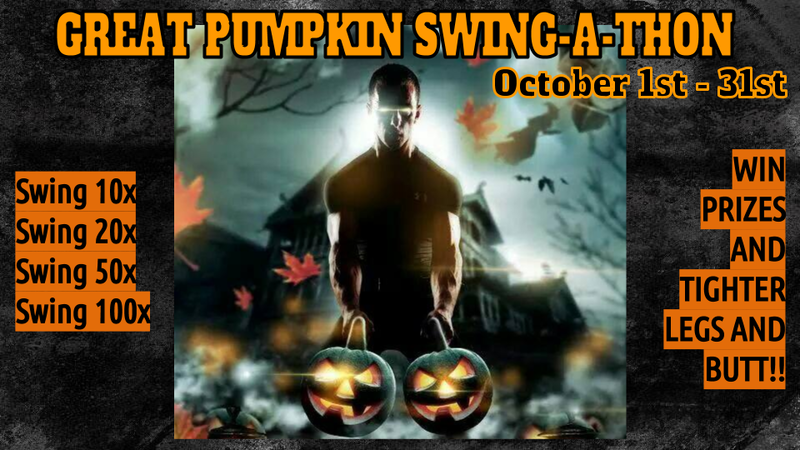 Challenge Raffle Rules: 2-Hand Swing the "Pumpkin" (28kg kettlebell orange) consecutively without setting the bell down. That's it! There is no limit to how many times you can swing the bell as long as you meet the minimum rep numbers below. SWING BUDDYDuring our challenge you can find someone you want to join forces with and Swing together to keep each other pushed and motivated to put up some greater rep numbers together. ***BONUS*** Category 3) Black Bell Swings: Same rules apply as for the Pumpkin Bell. The Black Kettlebell is 4.4lbs lighter than the Pumpkin so this is a great starter bell for Swing-A-Thon newbies. HOW YOU WIN PRIZESCategory 1) We will choose 1 random woman and 1 random man who will win our Great Pumpkin Challenge Raffle. You get entries for every qualifying sets of swings that you perform with the Pumpkin Kettlebell (28kg). For each 10/50 Kettlebell Swings for women, 20/100 Swings for men, that you perform you earn 1 raffle entry. There are no limits to how many sets of swings and so therefore you can get a many raffle entries as you want. On Nov. 1st we will hold the drawing for the winners. Raffle Winners of Category 1: 2 winners picked from the raffle!! Category 2) Second way to win is to be the TOP MALE or TOP FEMALE who swings (without stopping or setting the bell down) the Pumpkin Bell the most consecutive times will get automatically guarantees themselves the grand prize. The city of Houston was rocked by the hurricane and people’s homes and businesses were destroyed. They are running out of clean water to drink as well. So let’s help our friends in Houston. Now through our last class on Saturday we are raising 💰 support for the Lake Houston Relief Fund. We have a donation box on the desk and am asking everyone to drop $10 bucks right in. If you want to drop in more that’s cool too! If you are unable to make it in you can click the link below to donate directly to the Lake Houston Area Relief Fund. All the money we raise will go directly to them because they were hit the worst. Saturdays at Synergy are FREE!!! During June, July, & August Saturdays at Synergy are completely FREE!! Only pay if you want to join us during the week. Anyone can get results at any gym. Every workout program can deliver changes in our body. What happens when we don't see any? Let's not talk about results, how great our program is, or show a before and after testimonial. You've seen enough of that. Why does the slump occur, what keeps us from getting results, and what triggers us to finally take action is what we're exploring. This is the Un-testimony of Anne Barton.